In the 1970s, Margaret Thatcher had a impact on the world by becoming the first British female prime minister by her leadership, her hard work , and the changes on the world. In Margaret's first term she faced many military challenges with Argentina invading the Falkland islands. She sent British troops to the territory and took back the islands and then Argentina surrender. When the Conservative Party lost power, she proved herself and became a dominant force in her political party. Many people were impressed with her strategies and called her 'Iron Lady' because of her toughness. Margaret knew she wanted to be a politician by listening to her father stories and wanted to help the world. At an university, she won her first election by becoming president of student Conservative Associations. When Margaret got married and had kids it was difficult for her to keep up the hard work. Lots of Conservatives felt like she shouldn't have a career with young children to take care of, but she still tried harder. 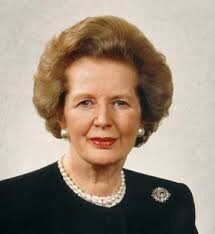 Margaret supported Ronald Reagan's raids on Libya and they combined forces and helped carry out the attacks. She helped encourage peaceful solutions for conflicts. Throughout the years of Margaret Thatcher have mostly been positive of her great leadership, hard work, and changes of the world in 1970s-1980s. She had a few ups and downs in her career, but she got though it and became the first british female prime minister. -Bio.com. A&E Networks Television, n.d. Web. 17 Dec. 2015. -"Who Is Margaret Thatcher & What Did She Do?" Essential Margaret Thatcher. N.p., n.d. Web. 17 Dec. 2015.